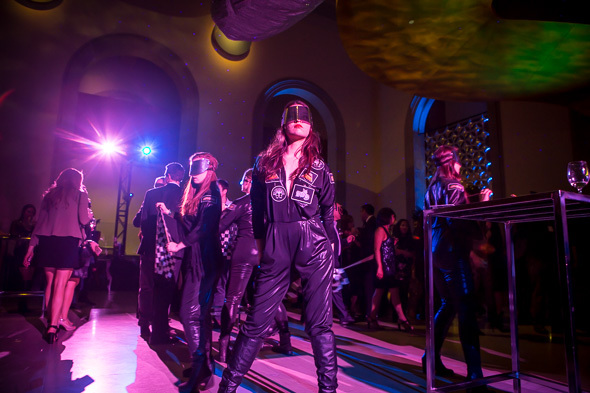 Last night the Art Gallery of Ontario hosted Midnight Massive Party, a magic-and-masquerade-themed fundraiser. 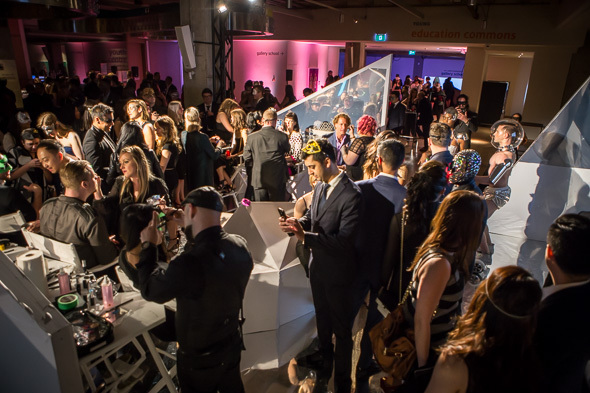 Now in its 12th year, 2016's Massive Party featured works from Toronto's top artists and musicians including Michael Vickers + Oliver Pauk, Robin Clason, and the Artistic Directors of Massive Party, the Broadbent Sisters. 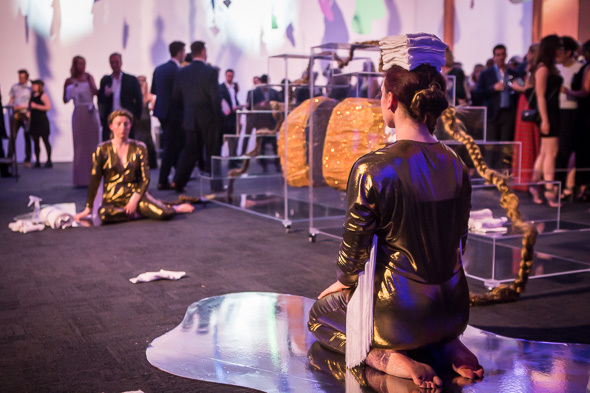 Rose and Joy Broadbent, the first females to act as Artistic Directors of Massive Party, noted that this year was all about turning the show on its head, allowing participants to become art in a celebration of the motif of transformation. 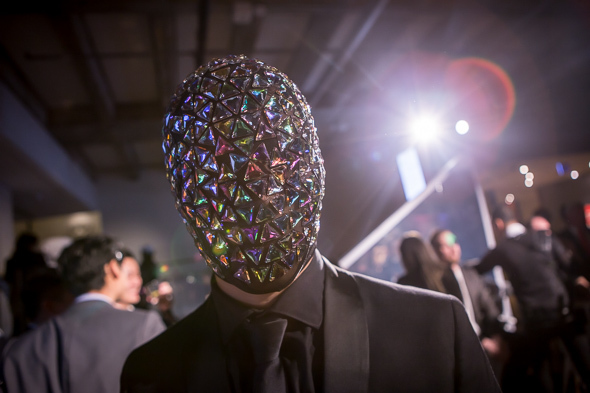 Guests were encouraged to arrive masked, "becoming anyone you want for one night only." The only actual mask I own is a high-quality Richard Nixon mask, so I instead "masked" myself with appropriately filled-in brows and "became" a person who knows what works for her bone structure. 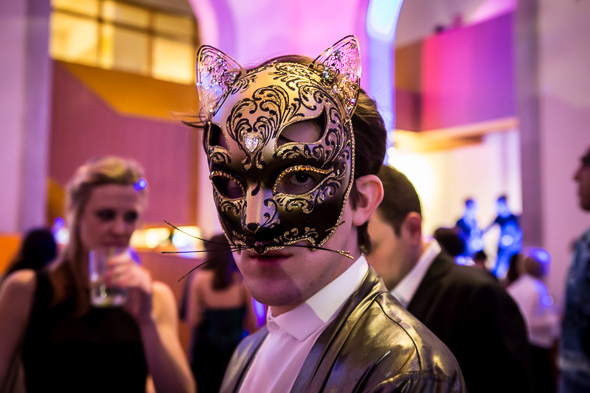 Upon arriving at Massive Party, I realized how seriously this theme was taken. 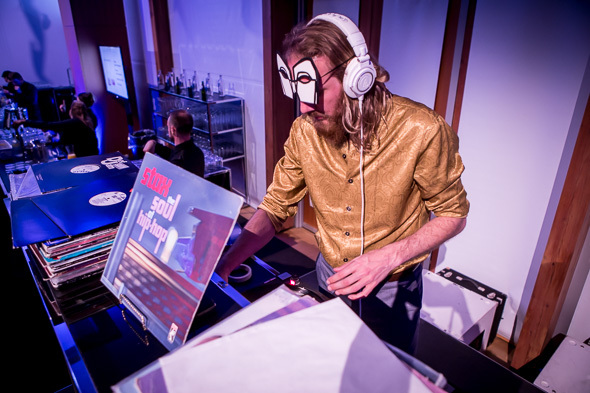 One guest was wearing a beautifully made Pulcinella mask, and another person had a balaclava covered in rhinestones. There was a woman with a mesh muzzle and a dude drinking beer through his wolf head. Everyone was taking tons of selfies. I was totally impressed and underdressed (though I heard someone misuse the word finagle and felt a bit better about myself). 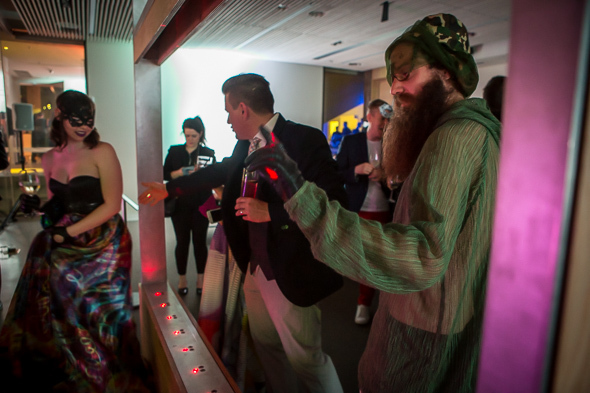 Massive Party was divided into three floors: Fire (Concourse Level), Earth (Level 1) and Air (Level 3). Water (represented by the bars) was available on all levels. 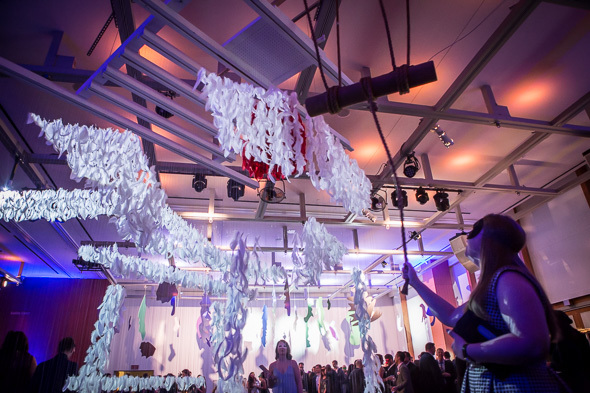 Each section had specific art installations and music that portrayed each element. 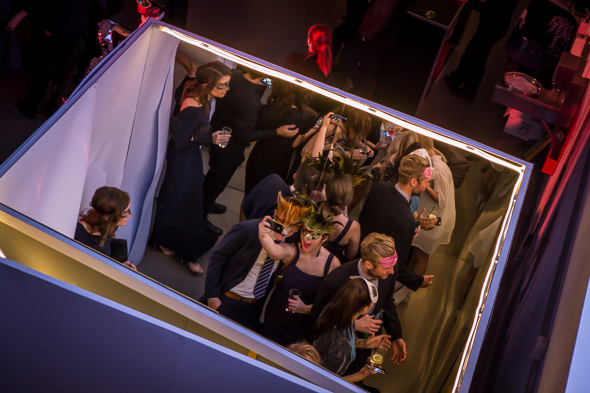 By having such different themes within one space, it really felt like there were three totally different parties going on at once in the same space, like when you invite your work friends, your neighbours, and your group of besties to one party but they all stay within their own original cliques. The main standouts from the art portion of the evening included the Broadbent Sisters' The Clearing. 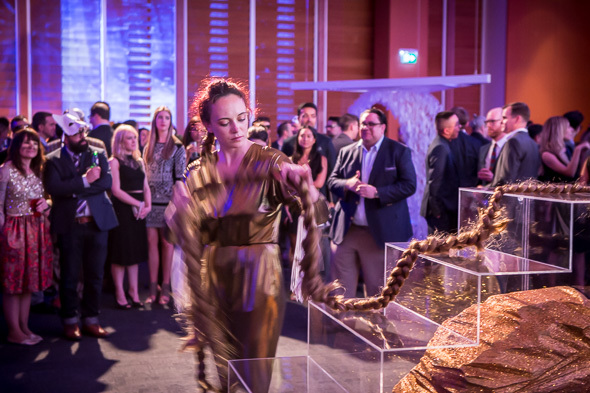 In this piece, Rose and Joy are conjoined via one long braid and perform mirrored cleaning of melted puddles in front of two halves of a glass staircase with a floating gold rock encased in it. As weird as it sounds, the sisters were mesmerizing to watch and the themes mentioned in the exhibit's description (domestic life, meditation, femininity, religious ritual and pop spirituality) were effortlessly conveyed without the use of words or even overt actions. It also made me wonder how clean their housing must have gotten in preparation for this party. Other notable pieces included Randall Okita's Be Here Now, a structure that appeared to be a temple from the distance but upon closer inspection, is made up of layers of feathers, The New Beat + Menalon's Lazer Harp, an interactive installation with lasers that emitted sound when triggered by a participant, and DJ Humble Mike's spins, which featured a lot of Prince, naturally. Downstairs, a marching band complete with dancers made it's way through the dance floor. People continued to take tons of selfies. 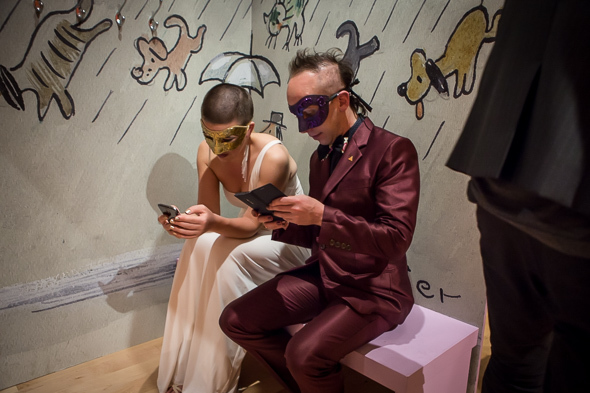 As I left, guests continued to enjoy the art, partake in the open bar, and devour the sandwiches set out at midnight. Midnight Massive Party was a great mashup of fun (dance floor! ), cultural (feminist art!) and weird (at one point there was a completely hairless gentleman in a space suit riding a hoverboard). 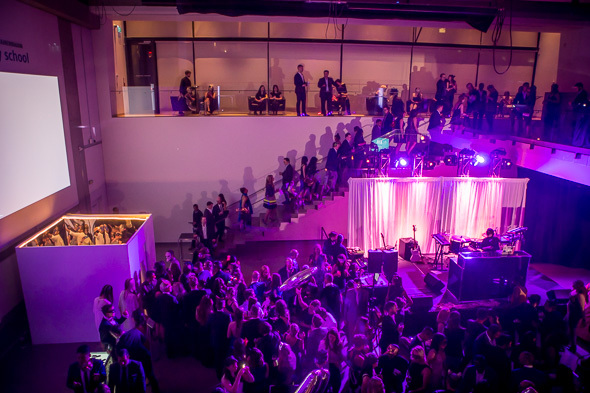 As an added bonus, the funds raised through Midnight Massive Party support the AGO (there's nothing more important than educating the next generation of Ontarians about the importance of a filled-in brow). Photos and video by Jesse Milns.